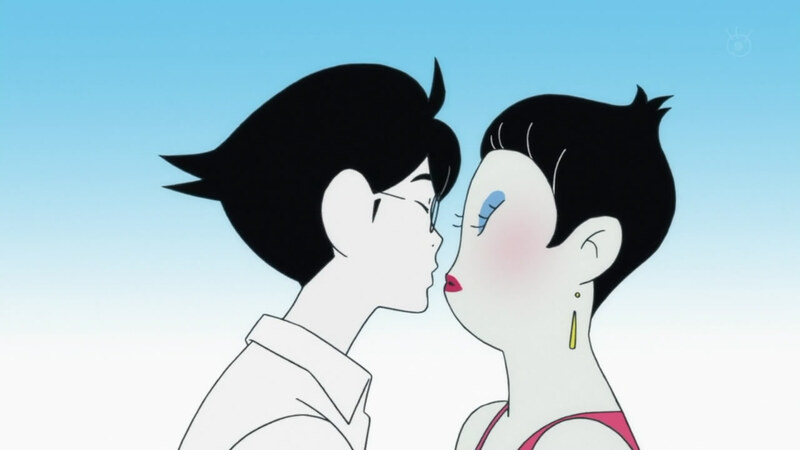 A lot has already been written on The Tatami Galaxy. 2DT entertains the notion that we’re looking at a reality unfolding in a multitude of ways. Although this is an interesting angle, I want to examine another aspect of the anime and why things always go wrong for our unnamed hero. I propose that Ozu and the unnamed hero are actually one and the same. First, I want to examine Ozu and his character. Ozu makes his appearance in each episode always roughly the same time and situation: when things have turned sour for our unnamed hero. Ozu’s sudden appearance in so many forms resembles that of a shape-shifting yokai, ready to prey upon the unnamed hero whenever he is at his lowest point. 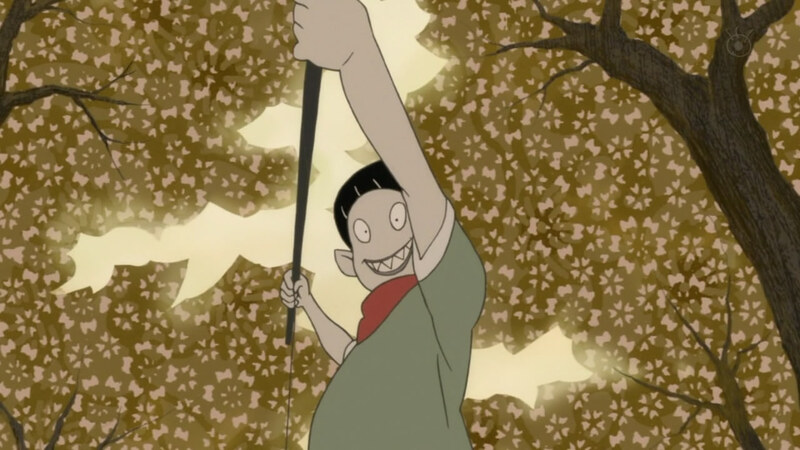 There are demons in Japanese folklore who aren’t quite evil, but they do play tricks and pranks upon man and this is indeed what Ozu does throughout the anime. From maraudering about as the black cupid to making worthless movies, Ozu resembles a mischievous, trouble-making oni. It’s probably no coincidence that he has a rather strange look about him, i.e. the pointed ears, the bushy tail, the mouth lined with fangs. 1. Ozu is a physical incarnation of the unnamed hero’s depression, frustrations, anger, etc. He comes to life when the unnamed hero is at his lowest point. 2. They are one and the same. People usually see only one of them at any given time — they usually interact with only one of them at any given time — with perhaps a few exceptions but we’ll get to that later. Ozu always enters the unnamed hero’s life with rarely a protest, going to and fro with little resistance. Ozu always locates his friend, capable of finding him whenever it is convenient. Most of all, the pranks Ozu brainstorms never come to fruition unless both he and the unnamed hero are complicit. In the second episode, the unnamed hero loses his resolve to complete a damaging exposé on Jougasaki until he encounters Jougasaki on the streets. 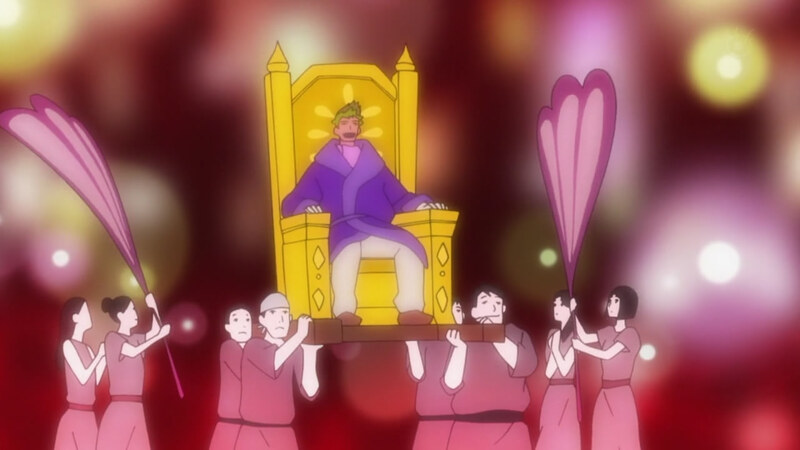 Interestingly, Jougasaki enters the scene carried on a throne like a god. In the very same scene, however, we see that Jougasaki is merely drunk and being held up by a few people. The mere presence of Ozu ignites the despair into anger, literally reflected in the unnamed hero’s eyes. It is here that he regains his resolve to complete the exposé on Jougasaki. Why is it important to point out that the unnamed hero is an unreliable narrator? The unnamed hero laments at the end of every episode that his life would be so much better had he joined a different club, but we know that this is patently untrue. No matter what club the narrator joins, his life falls into despair and Ozu is soon to follow. What becomes clear is that the unnamed hero is in denial. He blames his fate on his choice of clubs and Ozu, but the one constant in each story is the unnamed hero himself. As such, the blame for all the unnamed hero’s troubles should fall upon the unnamed hero himself and not Ozu. Ozu only appears after the unnamed hero has failed. Ozu seems more like a manifestation of the unnamed hero’s dark desires — an aspect of the unnamed hero’s dream-like reality — than a distinct entity. At first, I was thrown for a bit of a loop when Jougasaki introduced Ozu onstage. But then I recalled that the unnamed hero was hidden backstage in the shadows. The unnamed hero tellingly remarks that Ozu is playing both sides. In the first episode, recall the restaurant scene. As Ozu leaves, Akashi immediately enters. 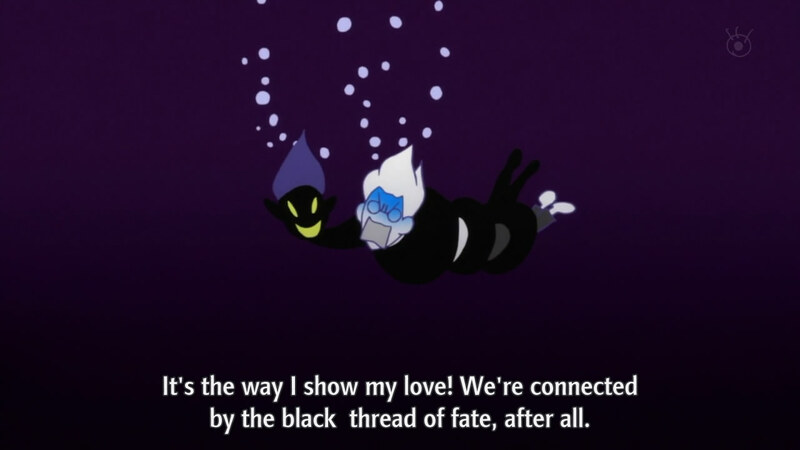 In the third episode, the unnamed hero makes an interesting observation: “Ozu never showed his face in the circle, but he’d frequently show up in my room.” Ozu constantly reminds the unnamed hero that they are both connected by the black thread of fate and therefore inseparable, yet the only person who seems to acknowledge the existence of both the unnamed hero and Ozu at any given time is the god of matchmaking. Furthermore, if the unnamed hero is unreliable, then who is Akashi? Is she really the girl that she’s described to be? Who is the god of matchmaking? Could they all be an aspect of the unnamed hero? Maybe. Perhaps he is dreaming, waking up at the end of each episode, and starting his dream all over again at the start of each episode. In this case, might Akashi represent a purer aspect of the unnamed hero — the unrealized, romantic potential? Akashi’s appearance in each episode always seems to serve as a catalyst for a flashback or a flurry of words from the unnamed hero describing who she is. We rarely get to see Akashi describe her own character. What she seems to invoke in the unnamed hero are memories of purer and happier times. Perhaps if he continues to give in to his dark desires (Ozu), he may lose his uncorrupted self (Akashi) for good. The promise in each episode seems to hint that the unnamed is losing his way, perhaps losing sight of his goals. Then what of the god of matchmaking? He seems to omnipresent, omniscient and omnipotent, entering and leaving the unnamed hero’s life just like Ozu. He seems to have only one purpose so far: to warn the unnamed hero that he may lose Akashi to Ozu. Despite his seemingly benevolent modus operandi, the unnamed hero often finds himself frustrated with the strange man. I theorize that he may represent the unnamed hero’s conscience, thus explaining his all-knowing nature of both the unnamed hero’s feelings and actions but Ozu’s as well. Returning to the unreliable narrator concept, what scenes are then real? What scenes are not? I wonder, for example, whether or not the unnamed hero truly lost his valuable bike to a bunch of criminals or did he simply create a lie to rationalize his own failure? He may fear success and the responsibility it entails. Many people have sabotage their own efforts so we can’t rule this out for the unnamed hero. Plus, the criminals who stole his bike are actually gorilla-like oafs; who would believe that they truly exist? This suggests we can’t take these scenes literally. Within the same episode, I wonder if he really saw the god of matchmaking win the race on TV or not. This leads us to the most crucial question: how much of the unnamed hero’s predicament can be blamed to fate and how much is utterly his own doing? I wonder if the key to unlocking his perpetual despair might simply be accepting responsibility for his own fate. Ozu may very well be a defense mechanism carried out to the extreme, a target for the unnamed hero to funnel blame away from himself. Other theories are fun to consider, but the application of quantum mechanics is a dubious one. Quantum mechanics are fun to imagine, but I don’t think the observer effect is supposed to be applied on such a macroscopic scale. On the other hand, I mentioned earlier that the multiple galaxy theory is interesting, but I don’t fully buy into it. The unnamed hero seems to arrive at a generally bad fate no matter what, suggesting that there aren’t infinite possibilities typically entailed by the idea of multiple galaxies and infinite causal relationships. In Groundhog Day, Phil’s days are all over the place. He has happy days, sad days, successful days, days full of failure — infinite possibilities really are infinite possibilities. For our unnamed hero, on the other hand, he continually finds himself in the same problems no matter how much the physical world changes around him. I think his problems are thus more internal than external. 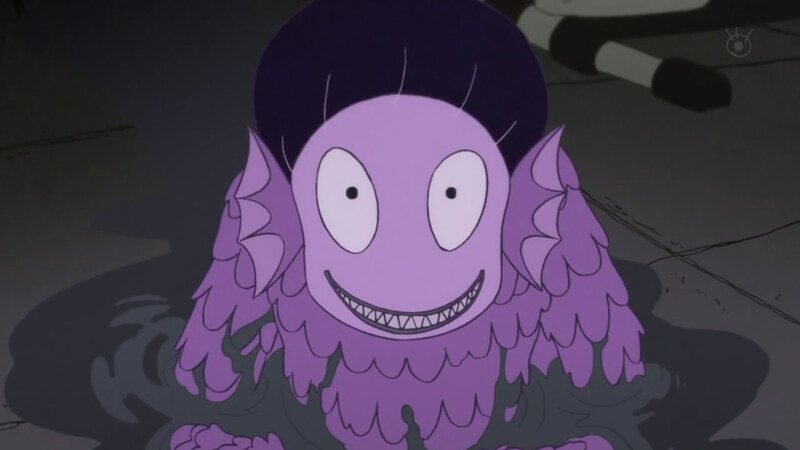 It has only been three episodes, so anything in the following episodes may very well destroy my ideas regarding The Tatami Galaxy. Even so, it has been an enjoyable viewing experience and plenty of food for thought. I’m just catching up as well, and I’m intrigued by the prospects so far. It gives us just enough rope to hang our minds with, and I agree with my roommates: the ED is fantastic. I wasn’t expecting anything nearly as good from Tatami so I hope it will keep this up and deliver where Angel Beats and Arakawa have fell flat for me. The music is solid, but I really enjoy the aesthetics moreso. It’s just too bad any deviation from the mainstream anime style immediately draws comparisons to Shinbo. I started this one, I just wasn’t in the mood to finish it for some reason. If it’s really that thought provoking, I’ll give it another shot. Perhaps thinking and anime can overlap once in a while, after all…. In terms of plot, it’s really nothing trailblazing. You get the gist of the same story if you’ve ever listened to another morose Japanese male lead complain about his fate. 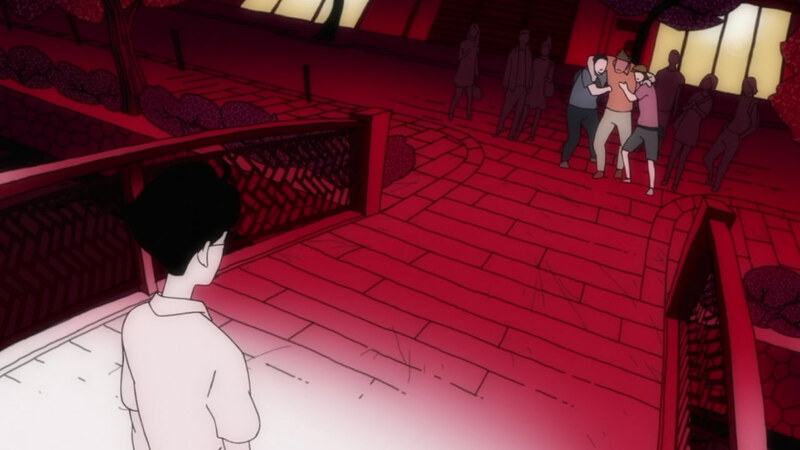 What makes The Tatami Galaxy fun to watch is trying to comprehend what’s going on behind the scenes. What bounds Ozu and the unnamed hero together? Why is he destined to fail? Your postmodern hypothesis of the ‘unreliable narrator’ is intriguing, but I believe it will be debunked in the following episodes. I have also pointed out in certain forums that it is quite impossible for Ozu and Watashi to be very much the same guy. Jougasaki in the third episode treats them as separate entities while he is training in Jougasaki’s place. The fourth episode further clarifies them as separate entities. Also note that in the OP, there is a scene where Watashi flips into a certain crayon-drawn cowboy and Ozu becomes a human, but still impish-looking guy. I have reason to believe that they represent the same people: it was already proven that the cowboy represents watashi; I think it’s only a matter of time before it will be proven that Ozu is also that impish youth. Akashi is understandably pivotal to the development of Watashi despite her absence, but it must be understood that she is as physical an existence as Watashi is. Kohinata-san, as what was seen in the first episode, is one of those ideal examples of humanity – and it must be noted that she is faceless. The same can be said about the Kohinata-san that appears in the fifth episode, and the Keiko that appears in the sixth. In the first episode, Akashi also talks to Ozu as if he were separate from Akashi. Anyway, just watch the next few episodes. It’s an interesting theory, but I think the anime later on debunks it. I may be wrong, however. Jougasaki in the third episode treats them as separate entities while he is training in Jougasaki’s place. In these training scenes, Ozu is merely included in the shots. He has no interaction whatsoever with Jougasaki as far as I can tell. We also have to consider from whose perspective these scenes unfolded. I believe they belong to the unnamed hero or, as you call him, Watashi. I already believe his point of view is not to be trusted or relied upon. From his point of view, Ozu may very well be there. 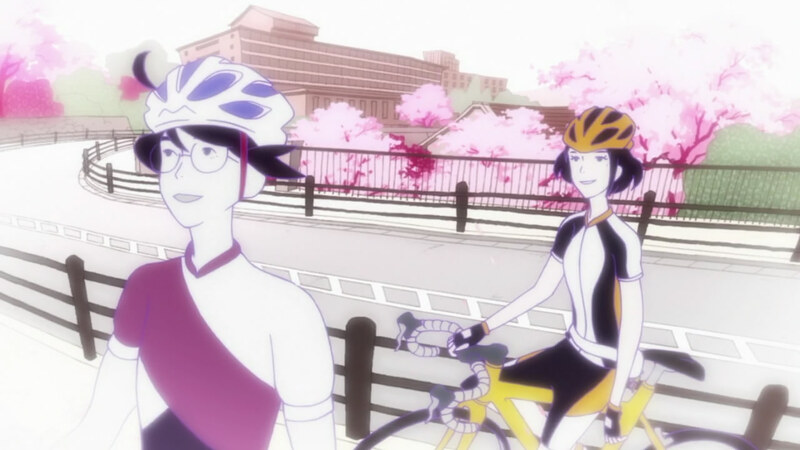 From his point of view, Ozu may very well be the one biking Jougasaki as he is jogging in front of them. I saw nothing that suggested Jougasaki interacted with Ozu in any meaningful way. I think it’s only a matter of time before it will be proven that Ozu is also that impish youth. I don’t understand how this precludes Ozu from being a facet of the unnamed hero. Akashi is understandably pivotal to the development of Watashi despite her absence, but it must be understood that she is as physical an existence as Watashi is. In order for us to say that “she is as physical an existence” presumes that what we are observing (i.e. 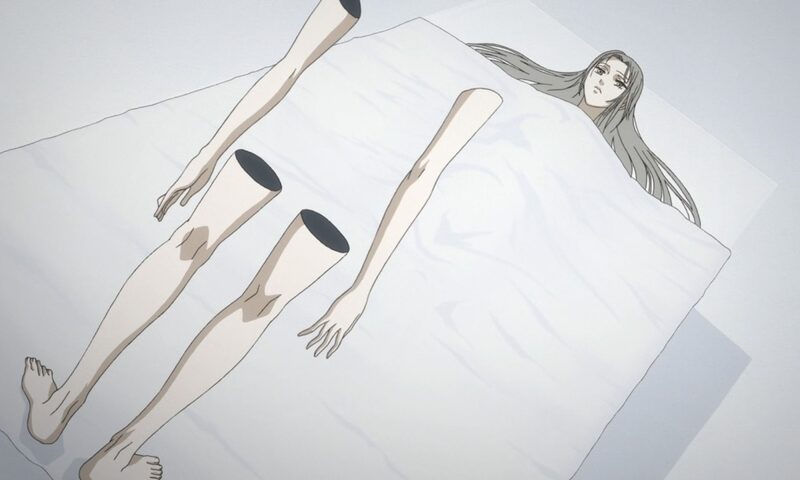 the entire anime) can be considered physical at all. 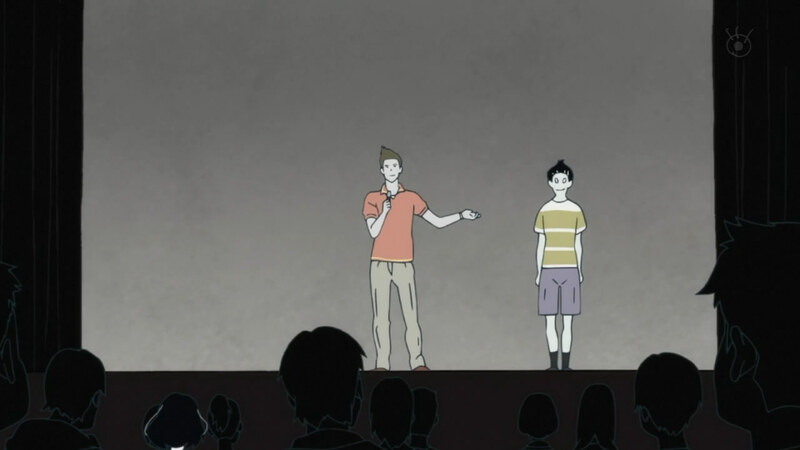 The reality in The Tatami Galaxy is quite surreal. In the first episode, Akashi also talks to Ozu as if he were separate from Akashi. Even if they are distinct, they may merely be distinct facets within the same character so there’s no reason why they could not talk to one another. We often have debates with ourselves when making difficult decisions. Using another story as an example, Dunya and Sonya are both separate physical entities from Raskolnikov, but they each represent a facet of his character nevertheless. Within the same scene, the crowd doesn’t notice the unnamed hero until Ozu has jumped. Only once Ozu has disappeared into the water does the crowd face the unnamed hero and throw him in along with Ozu. I just think it’s too much of a coincidence that they are inextricably linked. Ozu’s crimes are always the unnamed hero’s crimes, regardless of his level of involvement. And again, even if they literally refer to Ozu as a separate entity to the unnamed hero, I don’t think that can so much be relied upon. Not only that but this is a faceless crowd in the unnamed hero’s dream-like world. How real are they? From the unnamed hero’s point of view, why does the crowd throw him in? Might that reason change from someone else’s point of view? I’m simply saying that the entire anime is narrated by one guy and his testimony can hardly be trusted. Though you may be right; I haven’t seen the later episodes and they may prove me wrong. I just see nothing you’ve mentioned in the first three episodes that completely debunks my theory. They raise questions, of course, but I find your interpretation a little too literal. I find the anime to be equally surreal as you, only that I don’t really stray away from what it presents, even despite the lens of a narrator not really trustworthy. I’ve also entertained the notion that ‘everything is dubitable,’ because Watashi is unreliable, but that really didn’t leave me much to work with. Upon seeing the following episodes, following your hypothesis of an unreliability so total just seems implausible. I seem to think that your hypothesis pegs Watashi at a highly negative position – because if they were merely all constructs of his character he’d be bordering insanity, which I don’t think he is. He may be misguided, quite autistic, but I hardly think he is insane. Have I made anything up? If I have, I surely hadn’t intended to. I’ve only intended to analyze what I’ve seen. I just believe that what has been presented hasn’t been consistent nor credible. I’ve also entertained the notion that ‘everything is dubitable,’ because Watashi is unreliable, but that really didn’t leave me much to work with. I personally find the idea that the same strange impish character is haunting him across parallel worlds pretty dubious myself. To each his own. He may be misguided, quite autistic, but I hardly think he is insane. Funny, I didn’t think it made him insane. Maybe this is a dream. Maybe this is all playing out subconsciously. I don’t know (without a doubt) what the anime is about and that’s what makes it fun to discuss. But hey, I’m just blogging my thoughts; I could be wrong. Jung proposed two basic approaches to analyzing dream material: the objective and the subjective. In the objective approach, every person in the dream refers to the person they are: mother is mother, girlfriend is girlfriend, etc. In the subjective approach, every person in the dream represents an aspect of the dreamer. Jung argued that the subjective approach is much more difficult for the dreamer to accept, but that in most good dream work, the dreamer will come to recognize that the dream characters can represent an unacknowledged aspect of the dreamer. Thus, if the dreamer is being chased by a crazed killer, the dreamer may come eventually to recognize his own homicidal impulses. Gestalt therapists extended the subjective approach, claiming that even the inanimate objects in a dream can represent aspects of the dreamer. Ozu might represent a mischievous, trouble-making aspect, an excuse to exact revenge on those he feels might have slighted him. Akisha might represent the potential for good, struggling to pull him away from Ozu. That they might both represent aspects of his character doesn’t mean he has to be insane (though I wouldn’t rule it out). I just can’t see them being different personalities of Watashi. He is flawed, and quite autistic, but he is not as delusional as what you seem to propose. I respect our discussions, but I’ve refuted the charge that my argument requires him to be delusional. See my second reply to your previous comment. I’ve taken a look at your post and I’m afraid you haven’t taken my unreliable narrator concept as seriously as I have. I already explained how an unreliable narrator can cause one to perceive events quite differently than how they really are (ex: training with Jougasaki). You can list as many counterexamples as you’d like, but they only have force if you take a literal interpretation of the events in The Tatami Galaxy. I’m repeating myself, but maybe Jougasaki was biking behind the narrator, but from the narrator’s eyes, Ozu was there doing the biking. Again, why not? We’ve already seen that the narrator can’t be trusted, that his point of view can drastically change within the same scene. As you’ve said it yourself, the man doesn’t start to take responsibility for his own actions until the fifth episode. Each and every single time something bad happens in the initial episodes, he passes the buck at the end of the episodes, blaming his choice of clubs or Ozu. Maybe he’s not a chronic liar, but he has a very skewed perspective of his own life. I hadn’t considered the scene with Hanuki (it slipped my mind), but again, this is yet from the narrator’s perspective which I don’t completely trust. So Hanuki looks at the narrator and addresses him — are we sure this can be taken literally? In the narrator’s own eyes in the third episode, strange ape-like men stole his bike. Are we to take that literally as well? In that same episode, the god of matchmaking ends up winning a race. How likely is that? Getting back to Hanuki, maybe the narrator got a girl like Hanuki through being a jerk (acting like Ozu) and regretted it in some way. As a result, might not cause a divide/conflict within his own character? Might he not perceive himself with her and not with her at the same time? 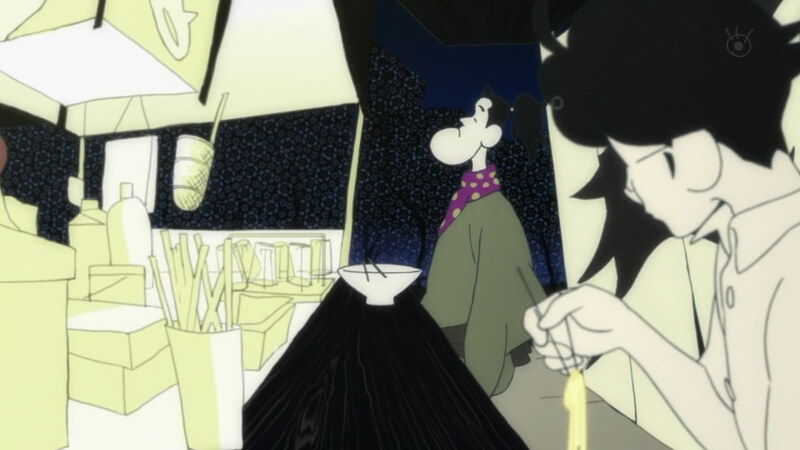 It’s possible if this is a fevered dream, something which we can’t rule out considering the phantasmagorical nature of The Tatami Galaxy’s setting. Even if we grant the case that Akashi and Ozu are absolutely distinct physical entities from the narrator, it doesn’t mean they can’t nevertheless represent an aspect of his character. Crime & Punishment is a “dream text” in which all the characters represent an aspect of Raskolnikov’s life. Although they are distinct physical entities and they address each other distinctly from one another, it is nevertheless the case that they represent Raskolnikov (e.g. the old woman he kills represents his mother and his financial dependence to her). 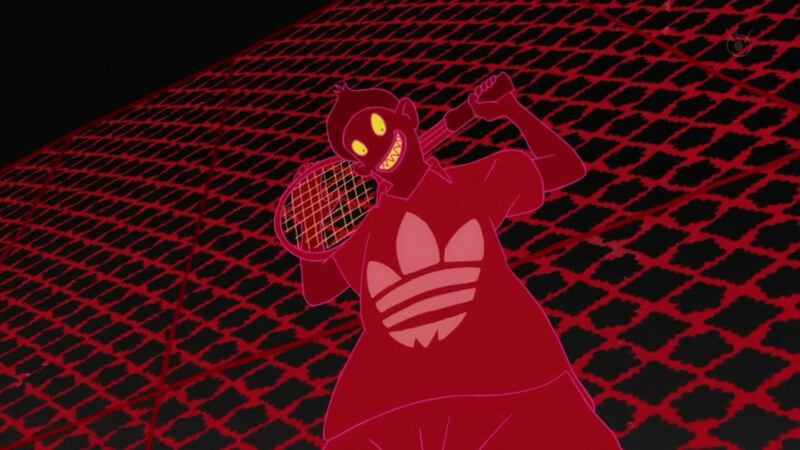 This isn’t entirely outside the realm of possibility for The Tatami Galaxy. 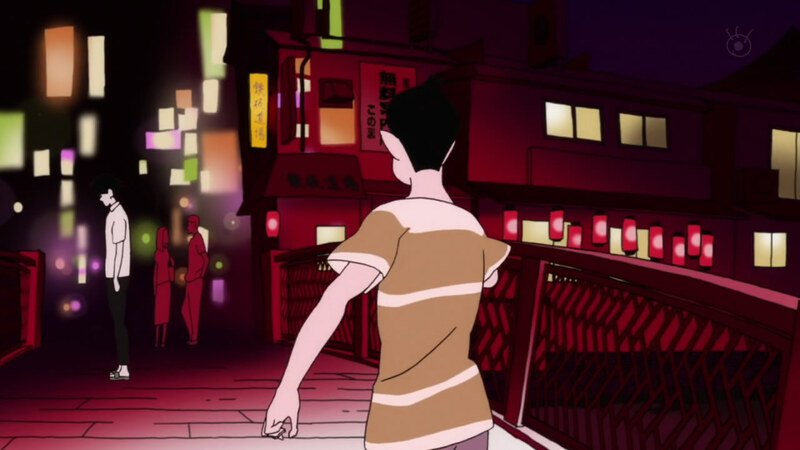 Even if Ozu is a distinct physical entity that other characters can address alongside the narrator, he can still represent the narrator’s darker side. Your central proposition is that they are one and the same, and that is what I disagree with. He may represent the narrator’s darker side, but he is not the narrator. That is what I disagree with. I think it’s all about the difference in our approaches: I approach the series exegetically, while it seems that you’re pursuing it in a postmodern manner I am not quite familiar with. I guess we’ll just have to agree to disagree. I may be able to posit counterexamples but you can still question them because you question the entirety of the narrator. So I guess … that’s that. He may represent the narrator’s darker side, but he is not the narrator. This sense of “is,” which I have emphasized in the above quote, seems to be where we are tripping up. I will take much of the blame; my usage of the concepts “sameness” and “identity” have been loose up to this point. Do I mean that they are physically or quantitatively identical? No. In terms of Ozu’s desires, actions and motivations, however, how much do these qualities truly differ from the narrator when he is at his nadir? This is the central thrust behind my argument and contention that Ozu is thus metaphysically more identical to the narrator than he is not. Combining this contention with my other arguments (e.g. the unreliability of the narrator), I am currently convinced that Ozu is the “same” character as the narrator, the caveat being that our ideas of “sameness” are not quite similar. Future episodes may prove me wrong and I’ll reassess my theory once I’ve viewed more of the anime. I actually had that same theory when I first started watching the show. It resonated with me for a while, especially in the one episode (i forget which) where the protagonist actually asks the question “what is Ozu?”. But with the story’s ending, I think it becomes increasingly clear that Ozu is more of a red herring than any sort of evil counterpart. The narrator was using Ozu as a scapegoat for his own inadequacies, blaming all the bad things that happen to him on Ozu directly when in most cases Ozu at most offered a few suggestions, or in some cases even advised him to do the exact opposite of what he actually does. Don’t get me wrong, Ozu is indeed a despicable person who delights in the suffering of others. But in retrospect most of what he did really wasn’t done with the intent of ruining the narrators life. In all the episodes, if only the narrator had made a different decision, he would have been closer to that “rose colored” campus life. The narrator felt that Ozu was his worse enemy, but as the story progress, we see that his real worse enemy is himself. I think the post you’re responding to was my assessment of the first three episodes so I won’t stand by everything I wrote. I have not written about the anime as a whole. yeah, I sort of realized that after sending the comment, but by then it was too late. I just finished watching the show a couple of a days ago, so it’s all still “new” to me. In any case, I still like the theory even if it’s not exactly likely. It’s quite a thought provoking show. Next PostNext Breaking down Kaichou wa Maid-sama!